Like you, I get sponsored Facebook posts all the time in my feed. I don’t click on them because I don’t want to reward the Facebook algorithm or the advertiser. 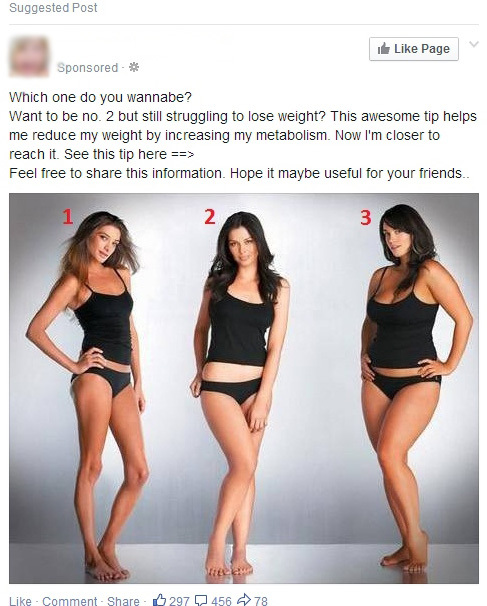 This time, however, I was curious about how the comments would or would not correlate with healthy weight. With such a leading statement in the status, there is an insinuation of an “ideal” shape, implying that 3 is too large and 1 is too small. If healthy and fit, shape doesn’t matter. I was pleasantly surprised how many mentioned that in the comments. Some agreed they wanted to be a 2 but more said 2.5 would be their preference, while a good number felt 3 looked great. (Side note: they all look healthy, simply different.) Very few chose 1 and that surprised me. Perhaps it’s an indicator that the general social mood has moved away from the societal demand to be ultra-thin. Are you healthy? Ask yourself. Do you make healthful eating choices most of the time? Do you have good energy and stamina, consistent throughout the day? Can you do pretty much everything you want with strength, endurance and freedom of movement? If your body is somewhat larger than average but you can answer positively to the above questions, you’re already healthier than the vast majority of folks around you. If slender is naturally your body type and you can answer positively to the above questions, fantastic. Of course, there may be other health considerations that come into play and a conversation with your physician can help address those. For most of us, let’s focus on answering the questions above instead of worrying about what “number” we are.